July 07, 2015 - "Press Releases"
FORT WAYNE, Indiana (July 2, 2015) - Built on the foundation of long-life products for industrial automation, PHD Optimax® actuators are designed to meet machine builders’ performance requirements at a competitive price. These economical, efficient, and reliable actuators provide an alternative choice to PHD’s standard “built-to-order” product line, delivering even more cost-effective solutions to meet industrial application needs. 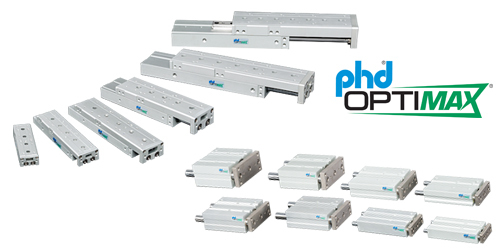 In a continuing effort to expand the Optimax product line, PHD is pleased to release two new drop-in replacement linear slides designed for the OEM market. These actuators are versatile and economical for use in the machine builders’ market. Optimax Series OSW Dual Bore Pneumatic Slide Tables are robust linear actuators designed for high power in compact spaces. Optimax Series OSP Compact Pneumatic Thruster Slides are robust linear actuators designed for high performance applications where slide length is a concern. To learn more and download/order catalogs, visit www.phdinc.com/optimax. For assistance, call (800) 624-8511.